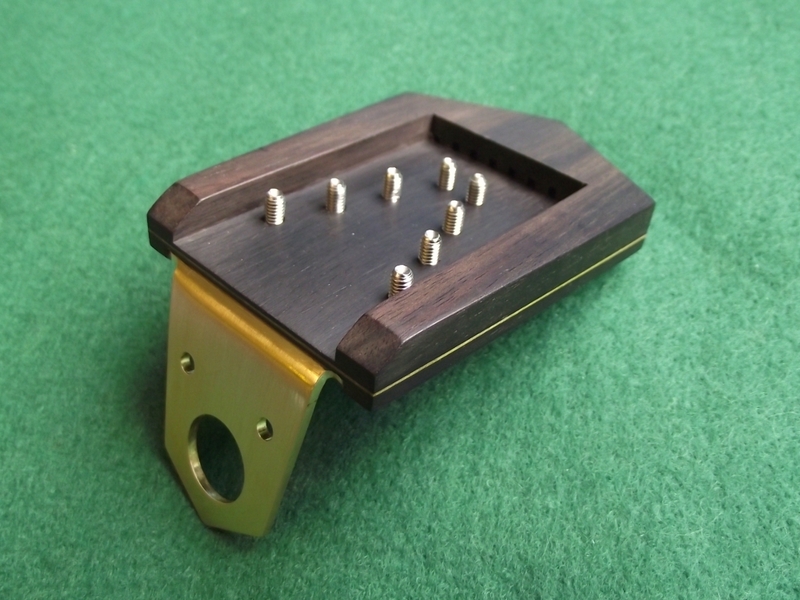 Mike’s Standard Plus mandolin has now been completed and was shipped out to him earlier in the week. The Indian Rosewood and Redwood combination produced a truly wonderful tone! Below are some photos for you. I’m now thinking of finally building myself (and the rest of the Nava family) a mandolin using a Redwood soundboard from the same board as this one! 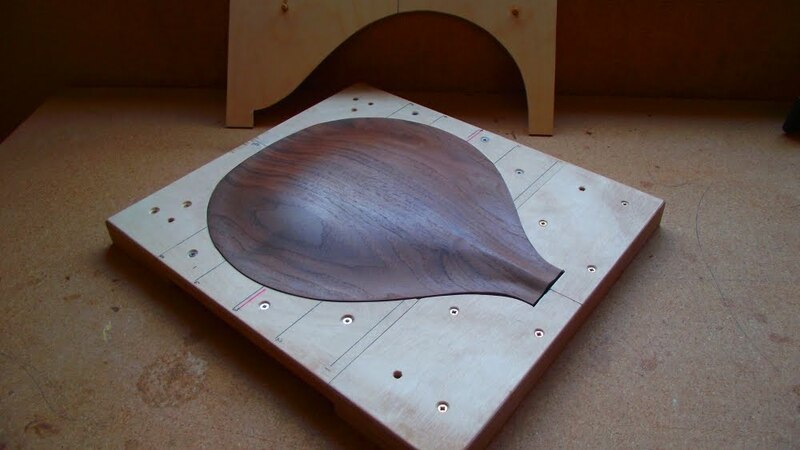 Watch this space……..
Here’s the tailpiece for the walnut archtop mandolin. You’ll see that there’s a thin green line running through it; this continues a decorative theme that the mandolin will have. I like to get the tailpiece made before the back is glued on to the rim, that way I can drill a hole for the jack socket and support the end-block to eliminate any chances of splitting. No doubt, you’ll remember that in previous posts I’ve extolled the virtues of my Veritas miniature block plane. Well, not anymore! The thread on the small screw, which holds in place the cap iron, has stripped thus rendering it unusable. I got on to Axminster and you can get a replacement screw, which I’ve ordered, so now all I have to do is wait 12 weeks for it to arrive! Looking at the plane’s design I can’t help feeling the some of the components are just too small to be robust enough for daily luthier usage. Coincidentally, at the weekend, I picked-up this old Stanley #101 plane. Back when it was first introduced, it was sold by Stanley as a toy plane, but as it proved popular with craftsman it was re-advertised as small plane block plane. Unfortunately the cap iron has broken, so the intention is to make a new one from some brass. The wee plane is clearly old and after looking at various web-sites, it seems that the S foundry mark on its castings means that it was made between 1894 to 1902. At least 116 year old then! Not sure if the complex miniature mechanism of the Veritas will last that long (well, not if I use it regularly!). This week I completed the back plate for the next archtop mandolin. I’ve put this video together so you can see how it’s done. Again, working by hand is physically demanding but also immensely satisfying. You’ll see how the simple jig, I showed you in the last post, effectively holds the back plate whilst carving. I’ve been working on the back plate for the next archtop mandolin. My objective with this build is not change the mandolin’s design (as I’m very happy with it) but to refine my building technique. The first thing that I’ve done is to make this simple jig which allows me to hold the plates whilst I’m carving them. The first modification to the jig, was to add this external template. It has a couple of dowels for accurate location and allows me to keep refreshing the outline as I work. As you can see below, it works!